Many people know Oyster Catchers as very large, black and white shorebirds found on Atlantic and Gulf Coast beaches. True to its name, it likes to feed on oysters. Here at the Kaelepulu Wetland, the tables were turned when an oyster caught one of the Hawaiian Stilts. 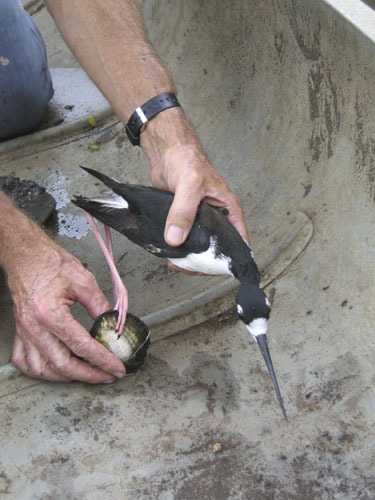 Early in the morning of April 25, 2005, biologist Larry Abbott and Hugo de Vries spotted a stilt flying over the wetland with a large oyster clamped tightly on its toe. A few hours later, she was clearly exhausted from trying to fly with the still-attached oyster. After conferring with wildlife biologists at the Department of Fish and Wildlife, they decided it would be best to try and catch the bird. The oyster weighed just over half of the bird’s total body weight, which made it relatively easy to capture the worn-out bird. When they pried the oyster open, it was obvious that the bird’s toe was badly mangled, with the bone sticking out. A visit to the avian vet was in order. At the veterinary clinic, it was determined that the toe needed to amputated. Surgery was quick. 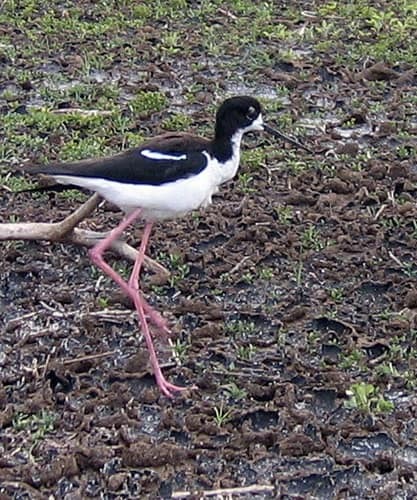 After some time in the incubator, this lucky stilt was ready to return to the wetland. We marked her right wing with white-out, so we could identify the bird in the wild over the next few days and monitor her recovery. The very next day she was seen with her mate, feeding and flying as if nothing had ever happened. After a week of sightings, the mark on her wing faded to the point that we could no longer identify the bird. The stilt with an oyster clamped firmly on her toe. 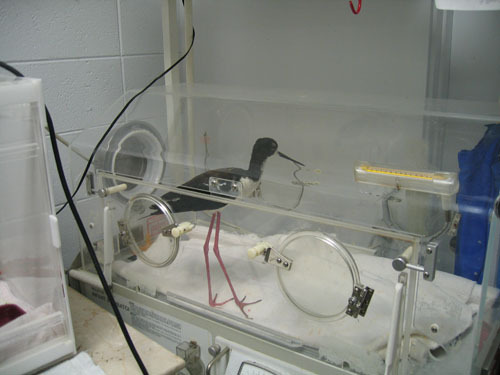 Recovering from surgery in the incubator. 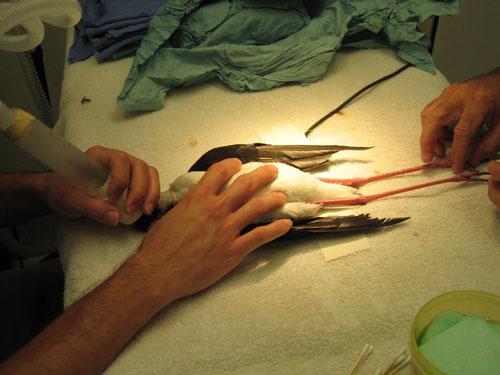 The recovering stilt shortly after being returned to the wetland. The white-out stripe is visible on the wing.